Despite the above statement by President Barack Obama, the Obama administration did small business no favors by raising taxes and passing Obamacare and Dodd-Frank. Business has no problem with legitimate regulations, but business leaders rightly object to “strangulation” of the economy with excessive rules and regulations. The economy never grew more than 3% during Obama’s years in office, the worst performance since the Great Depression. For the first time in decades, business failures now exceed new start-ups in the United States. Not a single new community bank has been formed since the passage of Dodd-Frank in 2010. The United States has fallen to #12 among developed countries in terms of business startup activity. Countries such as Hungary, Denmark, Finland, New Zealand, Sweden, Israel and Italy all have higher start-up rates than America does. But that is all about to change in 2017 with the new Trump administration. Business is back in business. It is the Year of the Business Entrepreneur. Donald Trump may not be the ideal role model — John Mackey, CEO of Whole Foods Market and creator of the new “Conscious Capitalism” model, is my choice — but the president-elect definitely favors pro-business policies, especially when they are in favor of small business. Trump has appointed several business leaders to top positions in his new cabinet, including Andy Puzder, the CEO of Carl’s Jr. and Hardee’s restaurants, as Secretary of Labor, and Rex W. Tillerson, CEO of ExxonMobil, as Secretary of State. Scott Pruitt, a pro-business attorney general from Oklahoma, has been selected to head up the Environmental Protection Agency (EPA), an agency that has destroyed many small businesses, ranches and farms. I hope these cabinet officers will adopt business-like measures to cut the waste and fat in government programs and put them on a pro-growth agenda. A vibrant, growing business sector is absolutely essential to a higher standard of living and better jobs. Our society does not give nearly enough credit to business leaders who create jobs, behave ethically and provide products and services that enhance our lives. Studies have shown that the key to higher economic growth comes from the supply side of the economy: encouraging saving and investment, capital formation, increased education, new technology and entrepreneurship. It is not enough to artificially stimulate spending through consumers or government programs that increased debt and deficits. The new Gross Output (GO) data that I’ve advocated for years confirms economic growth theory. Released quarterly by the federal government (Bureau of Economic Analysis), GO attempts to measure spending at all stages of production. Gross domestic product (GDP) deliberately leaves out the value of the supply chain, and therefore grossly underestimates the importance of the business sector. On the other hand, GO includes all business-to-business (B2B) spending to create final output. 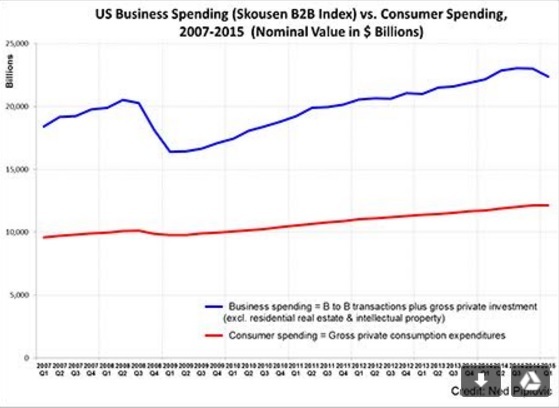 It shows that business spending is almost double the size of consumer spending in the economy and is much more volatile (See the chart below). It turns out that consumer spending represents only about one-third of the economy, not two-thirds, as is typically reported. I call GO the “top line” of national income accounting, and GDP the “bottom line.” For information on the revolutionary GO statistic, go to www.mskousen.com. Thus, it is business spending along the economic landscape that drives the economy. Consumer spending is the effect, not the cause, of economic growth. It is business that generates the jobs, income and taxes that keep a country going. Lawmakers who interfere with commerce and the normal creation of jobs in an economy run the risk of doing harm rather than good. Unintended consequences from regulating or legislating to achieve a goal can wreak havoc in the markets or an economy. The late, great management guru Peter Drucker contended that the growing corporation — not the state, the church, an alma mater or any nonprofit organization — is the “ideal non-revolutionary social welfare institution” to provide retirement income, medical and life insurance, advanced education and training, paid vacations and other benefits. A recent Gallup survey discovered that the number one determinant of happiness is “a good job.” That finding makes sense, since many adults spend most of their waking hours working and develop their closest relationships at their jobs. And private business is the number one source for satisfying employment. In an astonishing display of executive power, President Barack Obama used his executive authority to declare 1.5 million acres in Utah and Nevada — bigger than the entire state of Delaware — new national “monuments” called Bears Ears in Utah and Gold Butte in Nevada. The president used the Antiquities Act of 1906 to authorize the taking, even though the act specifically limits its use to “emergencies” to keep historical or prominent archaeological sites from being immediately destroyed. But no such emergency exists. The federal government already owns way too much acreage in the West and is unable to manage what it has. The U.S. government should be de-federalizing land, not grabbing more. Talk about abuse of power. State officials were quick to condemn the abuse of executive power. In a Fox News interview last week, Utah Rep. Jason Chaffetz said he is firmly opposed to the Bears Ears designation. “It’s one of the biggest land grabs in the history of the United States, and it was done as this midnight monument in the waning hours of the Obama administration,” Rep. Chaffetz said. Let’s hope President Trump reverses this executive order when he takes office, or at least encourages Congress to overrule this abuse of power. 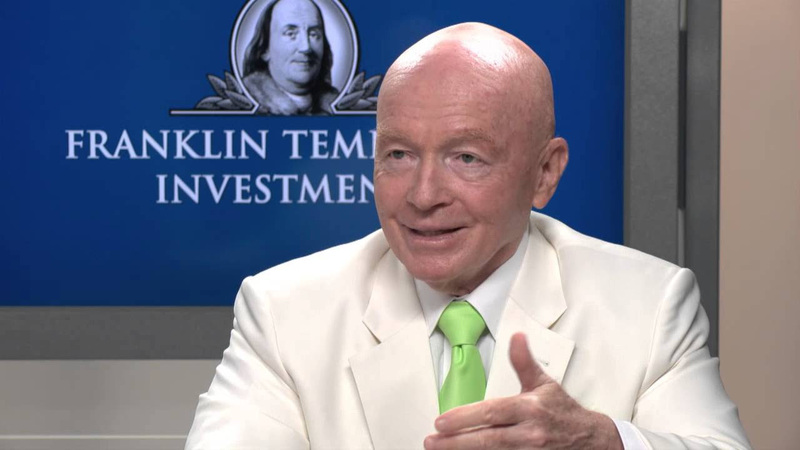 BIG NEWS: I have just confirmed that Mark Mobius, the legendary Franklin Templeton Emerging Markets Fund manager, has promised to attend and speak at FreedomFest. I’ve known Mobius for years, and he’s done a remarkable job in a very difficult sector, emerging markets. Yet investors have more than tripled their money investing in his offshore fund. Plus, I’ve added author Roemer McPhee, a graduate of the Wharton School of Business, to speak on “Killing the Market: The Story of the World’s Most Successful Investor,” based on his new biography of Robert W. Wilson, the legendary New York hedge fund manager who turned $15,000 into $800 million during his lifetime. Early Bird Discount Ends in Two Weeks!